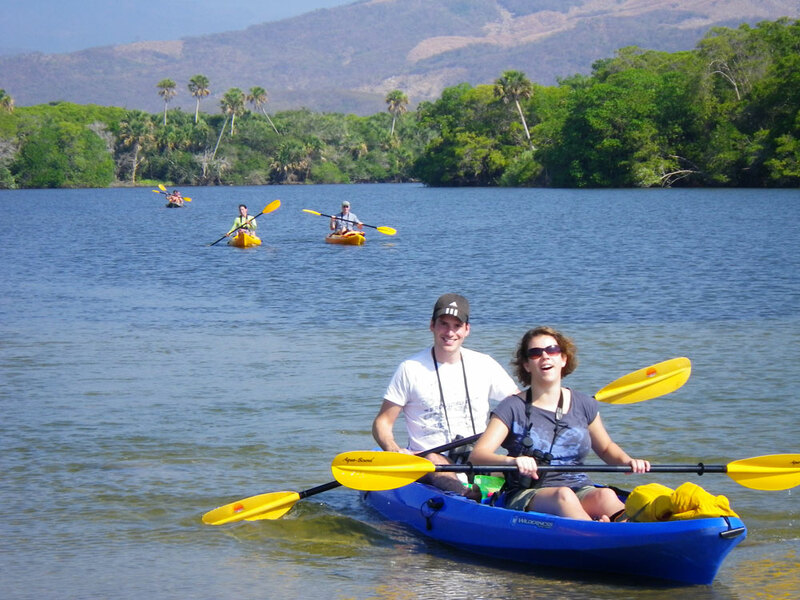 Visitors enjoy kayaking on Manialtepec Lagoon, near Puerto Escondido. For wildlife and nature lovers Puerto Escondido has something really special to offer: Laguna Manialtepec. The lagoon is a place of very rich biodiversity, created by three different aquatic ecosystems which come together. There is salt water from the Pacific Ocean, fresh water from the Manialtepec River and the deep water of the lagoon itself. This extraordinary ecosystem is home to about 300 different species of tropical birds and animals, such as otters or jaguarundi. Typical tropical birds in the lagoon are herons, ibis and egrets. But there are also exotic species such as the white-fronted parrot, tiger heron and roseate spoonbill. The most characteristic plant in Manialtepec lagoon is the mangrove, a special tree that can tolerate salt water: this is the perfect habitat for fish and shellfish, birds and other wildlife, that can hide perfectly in the mangroves, making the lagoon such a highly biodiverse habitat. Since 1981 scientists from Canada and Mexico have researched the lagoon and its wildlife, initially with financing by the Canadian government. Students from universities in Canada and Mexico do field courses twice a year here. One person who has supported the research is Michael Malone, who started Hidden Voyages Ecotours in the early 80’s. He offers his tours from December to March. “Ecotourism is a great way to create awareness, especially for the local people,” says Malone, who come to realize the lagoon’s value to tourism and offers opportunities for businesses such as ecotours or restaurants. Another attraction at Manialtepec is the phosphorescence, a chemical reaction in the water. At night when it is totally dark and the moon is not strong, you can see the illumination of the water at its best. Local fisherman offer boat trips at night to see this phenomenon. You can also jump in the water and see the blue illumination on your own body. Other lagoon activities include kayaking and stand-up paddling. • For tour information contact Viajes Dimar Travel Agency, at Zicatela Beach in the lobby of the Hotel Puesta del Sol and on the Adoquín.